intermittent pain along outside of leg from knee to ankle, awakening with numb foot, burning heel and big toe. Blockage in thigh artery and bypass with graft. Blocked again five months later and 2nd procedure to remove blockage from synthetic artery. Blocked again six months later and followed with angioplasty procedure, but with little improvement. Now left with intermittent claudication down side of leg and slight pain in knee. Very cold foot and burning sensation to big toe and heel. Awakening in mornings to numb foot. First discovery of disease through intermittent claudication to calf muscle. Presently treated with warfarin teva and innohep injected until warfarin stabilized. Normally daily warfarin intake = 2mg. The first question is whether the numb foot, especially seeing that it radiates into the big toe is vascular or neurological. 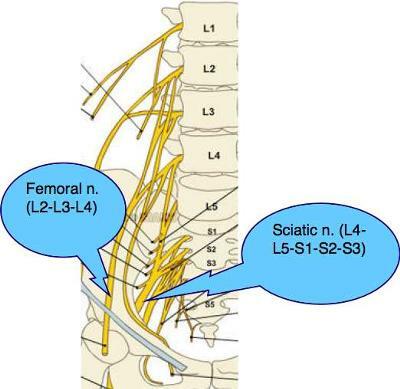 The side of the lower leg and big toe is where a sciatica following the L5 dermatome is typically located. This may have absolutely nothing to do with your angioplasty. Or, it's possible that in the surgery they damaged the sciatic nerve, but this is most unlikely as it runs down the back of the leg. 1. Bend forwards, backwards, and then backwards coupled with to the side, right and left. Any back pain, any tightness in the naughty leg, any pain or tingling down in the leg? Sciatica, not intermittent claudication. 2. Type "slump test" into the Search this site function at C-H. Does Slump reproduce the pain and numbness in your leg? As far as the circulation is concerned, make serious changes to your lifestyle... or else! Smoking, weight, walking, diabetes, foods that lower cholesterol like aubergine, hummus, big salad every day, fruit, minimum 5-10 coloured foods per day. Get deep into our Healthy Living Tips page. Good luck, let me know the results of those tests.